Life’s Next Steps Retirement Seminars Helps You Plan A Meaningful Retirement. Life’s Next Steps helps retiring baby boomers create a clear retirement plan that makes the best and most meaningful use of the time and resources at your disposal upon retirement. Our workshops help high-achieving, high-expectation men and women discover for themselves WHERE they want to go, and HOW to get there as retirement age arrives. With 80 million baby boomers nearing retirement in North America, many are asking themselves “What’s next?”. Our intensive programs, including a two-day workshop, help you to create real answers in the form of a life plan – a roadmap for the future – that you can act on. Life’s Next Steps is ideal for individuals and couples, and we also work with HR departments and the clients of Financial Advisors. The variety of the backgrounds, careers and goals of the people participating in the workshops is an important part of what makes them a learning and growing experience. Surveys have shown that while many boomers have dedicated plenty of effort and resources toward financial planning for retirement, seven out of ten are still struggling with the issue of exactly what they’re going to do to make retirement meaningful and engaging. One reason for this is that there’s a wealth of information, books and resources to help people prepare financially for their retirement – but very little support for boomers seeking guidance on how to spend that other precious resource in retirement – their TIME. 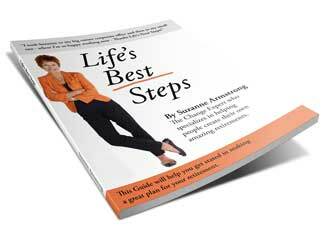 Life Next Steps’ mission is to help you take the crucial steps needed to articulate and develop your own unique life plan for retirement. The program is based on a proven three-stage process that helps you uncover your real strengths, interests and passions, build a retirement lifestyle plan around them and put that plan into action. The program includes the use of personal assessment tools to promote self-understanding, highly interactive workshops, and ongoing support from Life’s Next Steps and peer coaches. Retirement is not typically a time when people think about ‘making dreams a reality’ but this is the best time to dream in ways that will put precious time to a very good use. Boomers have typically led active, meaningful, accomplished and fulfilling lives. They will want to continue on that path into retirement to varying degrees. Past generations hit retirement, quit working, and happily proclaimed “That’s it.” This generation will be asking “What’s next?”. That will require some deep thought and careful planning – and Life’s Next Steps is here to help. “Can’t see the forest for the trees” refers to our tendency to focus on small details and fail to understand larger plans or principles. Believe it or not, the expression has been around for about 500 years. I guess it’s a common human problem. It’s what I thought of but didn’t say when John, a former corporate-change colleague came to one of our workshops. Arthur, a lawyer, kept insisting that he wanted and needed to work alone. In fact, he preferred to be alone in most parts of his life. Needless to say, his family found this to be a difficult trait to live with. Somehow, Arthur, who claimed to be a tough sell, managed to share his dreams, aspirations, and strengths during the workshop, but I could tell it was difficult for him.